Hello everyone! First thing I want to do in this post is to remind you of how awesome Orly Nail Rescue is. I had a HUGE AWFUL tear way down low in my middle finger nail this morning, which you can see here, and the Nail Rescue patched it right up. I have never used the teabag method for repairing nails, but this way seems easier to me anyway and works great. You can check out my post about Nail Rescue here. Moving on to the challenge nails. I am not feeling 100% today and was kind of uninspired about this prompt anyway, but eventually settled on doing the song Diamonds Are a Girl's Best Friend. I loved the design for the diamond from this amazing nail set by Donne of Hey Nice Nails and decided to try it out myself. The silver holographic glitter polish in this manicure is Lacquery Girl Band, which I have previously reviewed here and love. The black is OPI Black Onyx and the detailing on the diamond was done with an It's So Easy Nails Stripe Rite in black. Last year's "inspired by a song" nails were inspired by Ke$ha's Tik Tok. You can also view upcoming challenge prompts here. I'm sorry that your nail broke but glad you could rescue it. I'm sorry you're not feeling well but glad that you posted. I'm sorry that you were uninspired but glad that you did this rockin' (pun intended!) mani! Awesome! No, not at all! What else are blogs for! I love that silver polish so much! Want to have that! I love this! Simple, but totally represents the song. I saw the pic of your break, that is so sad! Hang in there! I love this, no surprise because I love all your work! 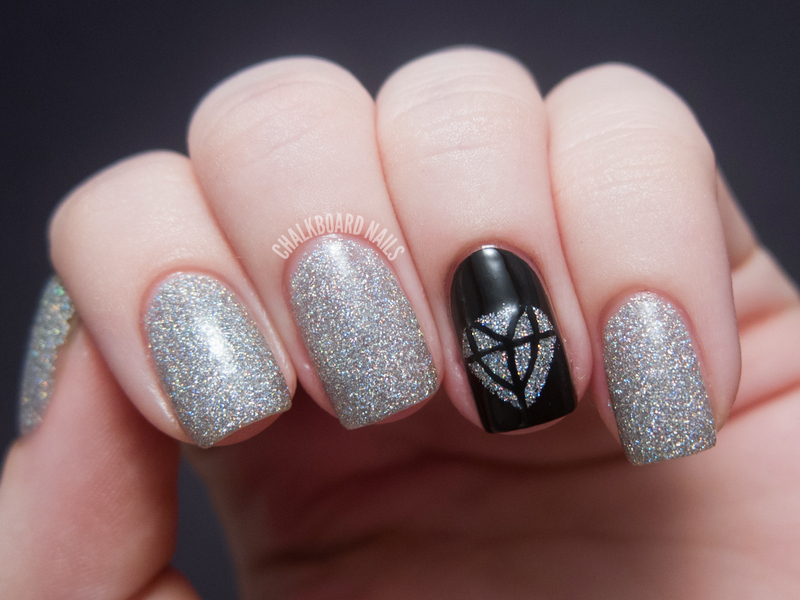 How did you do the nail with the diamond accent? I get you used the stripe rite to make the diamond, but how did you get that space where you can see the silver? I just painted the shape using the silver glitter over an all black nail. I super love this! Totally gorgeous and glittery! That is some blingy goodness! So pretty, I love the sparkle!